This year, 19th January happens to be very special. This day is not only the fourth anniversary of Swami’s Super Speciality Hospital in Bangalore but also the Silver Jubilee of Sundaram, Swami’s Mandir in Madras/Chennai. In addition, this year, 19th January also happens to the 158th death anniversary of the famous saint Tyagaraja. Every year, on the day of the death anniversary according to the Tamil Calendar, there is a reverential musical homage paid to Tyagaraja in Tiruvaiyaru where Tyagaraja lived and finally gave up his body. 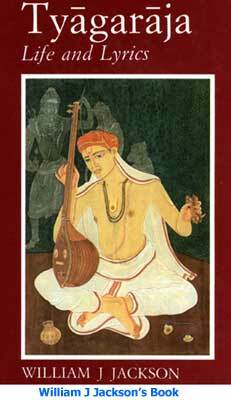 Tyagaraja is of course well known in South India, but elsewhere in the world he probably is not. If there is anyone who literally sang his way into the Heart of God, it was Tyagaraja. Last year, Heart2Heart paid homage to Saint Tyagaraja in a modest way; this year, we want to do a better job, both in Heart2Heart and on our radio service. In this special feature, we present many pieces about and related to Tyagaraja. We start with a biographical sketch, which follows. In India, there are two dominant styles of classical music – Hindustani Music whose domain is the North and Carnatic Music, largely confined to the South. By all accounts, Saint Purandaradasa is acknowledged as the Father of Carnatic Music. Purandara Dasa whose story has been enacted a few times before Swami, started off as a pawnbroker, and a pretty miserly one at that. But there came a turning point, when he realised with a start that there is a Lord who really pulls the strings. 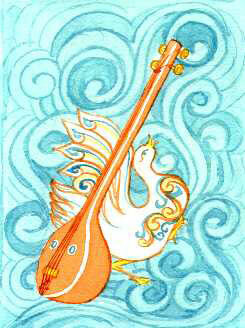 Thereafter, Purandaradasa became transformed into a musical saint. Although, Purandara Dasa gave Carnatic Music a start, it was the musical trinity of Tyagaraja, Muthuswami Dikshatar, and Syama Sastry, all contemporaries and all belonging to what is now Tanjavoor District of the State of Tamil Nadu. These really helped to bring structure to Carnatic Music, besides raising it to truly exalted levels. In what follows, we concentrate on Tyagraja, his life and his exemplary devotion to Lord Rama, via the path of soulful music. Tyagaraja was born in a small town called Tiruvarur on 4th May, 1747 in a Telugu Brahmin family, descended from immigrants from Andhra who went South towards the end of the 16 th century. Till that time, the Vijayanagaram Empire dominated Andhra, besides controlling the feudal kings of the South. In 1565, the Muslims destroyed the Vijayanagaram Empire, following which many Telugu speaking people, especially Brahmins, migrated to the South, seeking patronage of kings there. Thus it was that Tyagaraja’s ancestors who lived in Karkala village in what is now Kurnool District of the State of Andhra Pradesh, moved to Tanjore [now Tanjavoor] seeking the patronage of a Maratha ruler there. Tyagaraja was the third son of Ramabrahmam and Sitamma. Ramabrahmam was patronized by the then King of Tanjavoor, and engaged himself in spiritual activities in the royal court. When Tyagaraja was born, Ramabrahmam was living in the temple town Tiruvaroor where Siva is the presiding deity and is known as Tyagrajaswami, the King of Sacrifice. The little baby was named after the local deity. 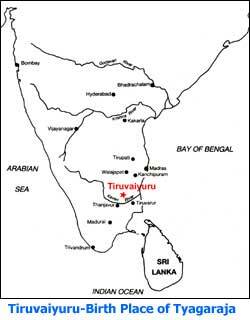 Soon after Tyagaraja was born, Ramabrahmam shifted to Tiruvaiyaru village on the banks of the sacred Kaveri river where the King gave him a house to live in and also some land. At the age of eighteen, Tyagaraja was married to a girl named Parvati who died issueless. Thereupon Tyagaraja remarried, taking as his second wife, Kanakamba the younger sister of Parvathi. They had a daughter Sitamma, who was given in marriage to one Kuppuswami. To this couple was born a boy but this boy, Tyagaraja’s grandson, died without any children. Thus the lineage of Tyagaraja came to an end. If one goes through the story of Tyagaraja’s life, one cannot escape the impression that he was born for music; not just to create music that enthrals but to show without a trace of doubt that music is unquestionably one of the best ways of attaining God, if not the best. As Swami often tells us, God is Ganapriyudu, a Lover of Music; not merely that; Swami also reminds us that one of the names of God is NADABRAHMAM – that is to say, [good devotional] music IS God. It is said that as a small baby, Tyagaraja would stop drinking milk, when he heard music. The story is also told that as a boy, every day on his way to the temple, Tyagaraja would pass by the house of one Sonti Venkataramiah, Principal Musician in the court of Sarabhoji Maharaja, then ruler of Tanjavoor. Every time he passed the house, young Tyagraja would stop to listen to the music lessons being imparted by Sonti Vemkataramaniah to his students. One day, when Tyagaraja was listening from outside, the teacher asked his students a tough question in music. None of them could answer but young Tyagaraja who was standing outside, shouted the answer. The teacher was amazed to hear someone other than his students give the correct answer. He opened the door, came out and saw the young boy who had answered his question. One look and he knew that there stood before him the dream student. 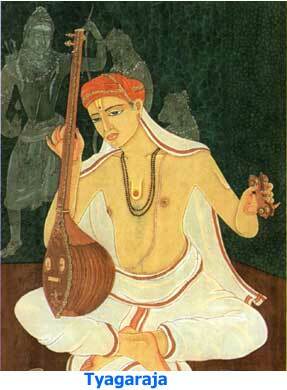 Almost immediately, Tyagaraja became a disciple of Sonti Venkataramaniah and started taking musical lessons from him. This brings us to the musical genius of Tyagaraja. It appears that although Tyagaraja took musical lessons, he did not follow the classical path of a student making a debut as a singer, then becoming a concert artist, etc. For him, music was a vehicle for communing directly with God. However, that path opened up in a very special way. 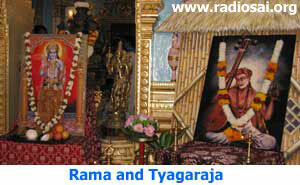 Tyagaraja’s father Ramabrahmam had been initiated into the chant of the powerful Rama Mantra. Unfortunately for Ramabrahmam, his first two sons were not up to the mark spiritually. Tyagaraja the third son seemed to be different. So the father promptly taught his son to worship of Rama daily. Like his father, Tyagaraja too was initiated into the chant of the name of Rama, and this, it appears, was done by one Ramakrishnananda Swami. Tyagaraja kept chanting the name almost non-stop, and when he crossed the ten million mark [one crore], it seems that Rama appeared momentarily and gave Darshan. An ecstatic Tyagaraja burst into song, and from then on there was no looking back. There is another tale describing how Tyagaraja was specially chosen by the Lord to spread Bhakti through the medium of music. According to this, Tyagaraja quietly started worshipping Sage Narada in order to learn the deeper secrets of music. As those familiar with Indian scriptures and tradition know, Sage Narada is a wandering saint, singing the glory of the Lord wherever he goes. He also described the nine ways by which humans can attain God, the famous Nava Rasa Bhakti Marga, to which Swami makes a reference ever so often. Apparently, Narada was pleased with Tyagaraja’s dedication and devotion, appeared before the devotee and gave him a Divine musical treatise containing the secret and mystery of musical notes. Thus Tyagaraja was doubly blessed; he received the treasure of musical knowledge directly from Sage Narada and he had also been blessed by Lord Rama Himself. Whether one believes in these folklores or not, two things cannot be questioned. Tyagaraja’s genius is literally unparalleled – he holds a position of almost unattainable eminence like Shakespeare in literature and Beethoven in Western Music. And, what is more important, Tyagaraja dedicated his music entirely to Lord Rama. 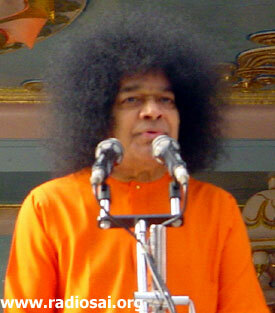 Swami says that we must start the day with God, spend the day with God, and end the day with God. If we want to know how to do it, then we would do well to study the life of Saint Tyagaraja. In the morning he would wake up Lord Rama! He would, in the course of the day, chat with Rama through his many songs. Sometime, he would praise Rama; sometimes he would make prayerful requests to Rama; sometimes he would wail to Rama about his personal difficulties and sometimes he would even complain to Rama! In fact, if one carefully examines his life and compositions, one can, without doubt, find shades of the nine paths of devotion prescribed by Sage Narada. Tyagaraja kept to himself and spent most of his time communing with Lord Rama – he simply did not have time for promoting himself in the community through his musical talents. Nevertheless, he soon became known for his singing. One day, his Guru Sonti Venkataramaniah sent for Tyagaraja and asked him to sing some of his own compositions in the presence of leading court musicians of the day. Normally, Tyagaraja avoided singing before others, but this was different; his Guru was asking him to do so, and so he obeyed the command and sang. Whenever there is exceptional talent, there appear people who try to take charge of such people and “manage” them, a practice so very common these days. Interestingly, Tyagaraja’s elder brother Japesan decided that he should “manage and market” his foolish younger brother who did not how to make a fast buck. Since Tyagaraja was already well known despite his scrupulously avoiding public concerts, Japesan managed to convince the King of Tanjore that Tyagaraja must be invited to the court to sing in the royal presence. In keeping with the tradition of the times, the King sent a messenger with lots of gifts, and asked the messenger to invite Tyagaraja to sing for the King in the royal court. It is interesting that there was actually a strong tradition amongst the highly evolved persons of those times to flatly reject the patronage offered by the rich and the wealthy, including Kings. There are any number of stories similar to the one just narrated. Rejection of worldly offers and dedicating oneself solely to the Lord was the hallmark of saints of those days. The story does not end here. Japesan became furious at what he regarded as Tyagaraja’s downright stupidity and, in a fit of anger, threw into the Kaveri river, the idols that Tyagaraja lovingly worshipped every day. This happened when Tyagaraja was not at home and unfortunately for Tyagaraja, there was also a flood in the river. Thus came a testing time for the devotee – a period of unbearable separation from the Lord. Swami says, “Do not make God into a picture but elevate the picture to God.” This certainly applied to Tyagaraja. 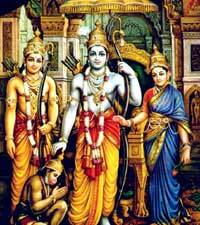 For him the idols he worshipped were not merely idols but Rama, Lakshmana and Sita in person. The songs that Tyagaraja composed during this period of “separation” reflect, understandably, intense grief, sorry and agony. When the flood receded and the water level came down, Tyagaraja went into the river to look for His Lord, and by His Grace, found the lost idols. He burst into a song, this time full of joy and ecstasy, marking the end of the separation period. After that, Tyagaraja welcomed Rama back into the house with yet another memorable and sweet song. Devotees of the Lord often go on pilgrimages to various holy places, but Tyagaraja was not cast in that mould. There are, however, accounts of his visits to a few places, almost entirely in the South. 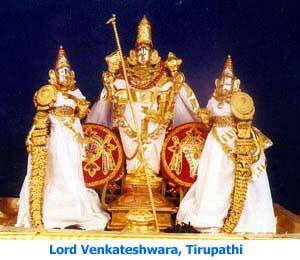 The northernmost part he visited was Tirupathi, where Lord Venkateswara is the presiding deity. There is a story behind Tyagaraja’s visti to Tirupathi. Tyagaraja was actually invited to Madras by a rich patron of music but he refused, naturally. This rich man then went to a noble sannyasi and a great devotee of Rama named Upanishad Brahmam, who lived in Kancheepuram near Madras. This Upanishad Brahmam was a friend of Tyagaraja’s father and having heard of the talents of the son of his friend, wanted to see him. So he sent an invitation to Tyagaraja, inviting him to Kancheepuram. This formal invitation, known as srimukham, exists to this day along with some of Tyagaraja’s own writings on palm leaf of his compositions, in the Saurashtra Sabha in the temple city Madurai in Tamil Nadu. Tyagaraja then decided that he would go to Tirupathi and stop in Kancheepuram while returning, to see Upanishad Brahmam. In Tirupathi, Tyagaraja entered the sanctum sanctorum of the temple where the idol is installed but it so happened that at that time the curtain was drawn, hiding the idol. It is a tradition in Hindu temples in South India that when the idol is being washed or decorated, the curtain is drawn. And when Tyagaraja saw the curtain, he sang memorable sang, asking: “When will this curtain come down? O Lord, I have come all the way to have Your Darshan and You are behind a curtain! Will You not please make the curtain fall so that I can see You?” It seems that the curtain immediately fell down, allowing Tyagaraja to have the Darshan of Lord Venkateswara. This is the folk lore. However, scholars say that what Tyagaraja was really praying for was for the curtain of Maya or delusion to come down, so that he could have the vision of the Lord without any Mind-made distortions. Given Tyagaraja’s depth of devotion, this probably is the real significance of this wonderful song. From Tirupathi, Tyagaraja turned back and on his way stopped in Madras (now Chennai). 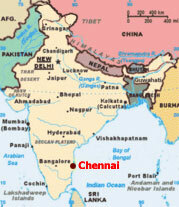 We are here talking of a period around the year 1800 when Madras was far from the huge metropolis it now is. There was of course the main town, scattered around which were many villages, all of which have now been swallowed by the megapolis the city has since become. Though Madras had not yet become a big city then, there were in the vicinity of the city many patrons of Carnatic Music. One of them was Kovur Sundaresa Mudaliar, who warmly extended his hospitality to the Saint. Patrons in those days, wanted poets and musicians to sing their praise in return for the patronage conferred. 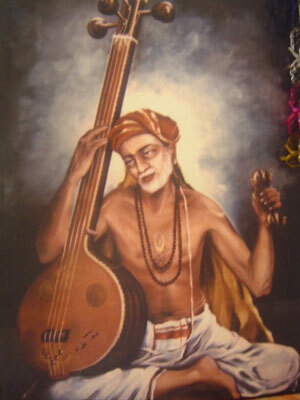 It is said that Sundaresa Mudaliar dropped hints that he would like Tyagaraja to sing a few songs in his praise. Obviously Tyagaraja could not and would not do that. So how did he handle this delicate situation? Literally by following Swami’s dictum: “If you cannot oblige, speak obligingly!” What Tyagaraja did was to go to the local temple where the deity was Sundaresa [this is one of the names by which Siva is known]. And there before Lord Sundaresa, Tyagaraja sang five glorious songs in praise of Sundaresa [the Lord and not the host!]. This set of five songs are known as Kovur Pancharatnams [the five gems of Kovur]. Sundaresa’s consort in Kovur is Tripurasundari [a name of Parvathi], and moved his love for Mother, Tyagaraja also sang many songs in praise of the Goddess. When finally Tyagaraja took leave of Kovur Sundaresa Mudaliar, the host gave a palanquin for the Saint to travel in. While the party was proceeding south, a gang of robbers attacked them. Tyagaraaj was surprised; why was a robber gang attacking them? They had no money or valuables; why then? When he posed this question to one of his disciples, he was told that unknown to him, Sundaresa Mudaliar had given the disciples a lot of money, saying it was all for Rama’s work. 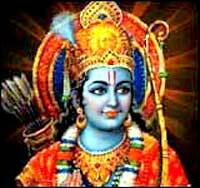 Hearing this, Tyagaraja is reported to have said, “In that case, it is Rama’s problem. He has to protect what belongs to Him,” and sang a song invoking the protection of the Lord. At that time, there appeared, seemingly from nowhere, some hunters who attacked the brigands and drove them away. And after vanquishing the robbers, the hunters vanished but not before giving Darshan to them as Rama and Lakshmana. All this was reported to the Saint in great detail, whereupon he saw how lucky were the robbers to get the Darshan of the Lord whereas he, a life-long devotee was aching for the same all the time. That is how the Lord plays sometimes with his devotees; for Tyagaraja, it was one more occasion for a memorable song. Tyagaraja then went to Kancheepuram to meet Upanishad Brahmam, and sang songs on Lord Vishnu who appears as Varadaraja. 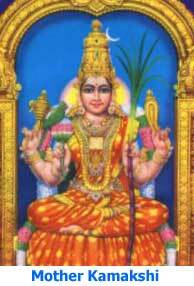 He also composed some songs on Devi Kamakshi, which is the name by which Parvathi the Universal Mother is known there. The late Paramacharya of Kanchi once gave a graphic description of this song. He said that on the way to the place where the idol of Kamakshi is installed in the temple, Tyagaraja had to pass by many idols of Vinayaka the first son of Parvathi. He then sang a song asking Mother Kamakshi to protect him also the way She protected Her son Vinayaka. We see from this and many other such songs that though Tyagaraja was a devotee of Lord Rama, he saw Rama as the Supreme Lord who took many forms; thus he saw no contradiction in his worship of many forms for in his mind they all belonged to only ONE GOD who, for him, was Rama. 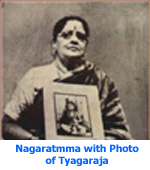 Years passed; Tyagaraja’s wife passed away and he was now in the eighties. Ten days before he gave up his body, Tyagaraja had a vision of Lord Rama on the top of a hill as if in Lanka, getting ready for the battle with Ravana. Tyagaraja composed a song recalling this vision. Apparently, at the time Rama appeared – and this was on 27th December, 1846 – Rama gave the assurance that he, Tyagaraja, would merge with Him ten days later. On 5th January, 1847, one day before he was suppose to receive the final call, Tyagaraja formally took sanyas, that is to say, he became a renunciate, in accordance with the Hindu tradition. Next day he passed into eternity, merging forever with Lord Rama. Whereas householders are cremated when they die, sannyasis are buried. Tyagaraja was interred at a spot on the left bank of the Kaveri river with all the rites due to a Sannyasi. A tulsi plant was planted near the spot. In the years to come, that spot got built up progressively and that is where the saint is worshipped today; and that is also where musicians have been paying homage to him for nearly a century. During his life, Tyagaraja attracted many students and to each he imparted a “corpus of his compositions according to the student’s voice-quality and musical equipment”. It is to these students and in particular to three branches that we owe the legacy we now have. The three branches, or schools that emerged are those associated with the places Umayalpuram, Tillaistanam, and Walajapet. Some disciples also took the trouble of documenting Tyagaraja’s life. The first two biographies were written by the father and son duo, Venkataramana Bhagavathar, and Krishnaswami Bhagavathar of Walajapet. 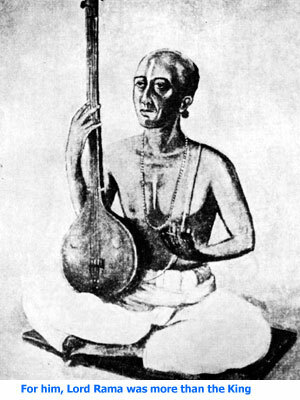 Venkataramana Bhagavthar was born in 1781 and spent many years with Tyagaraja. He died in 1874. His son Krishnaswami was born in 1824, and he too spent some years with Tyagaraja. Both the father and the son wrote their biographical texts in Telugu, and all other accounts that were published subsequently have naturally relied a lot on these basic texts. 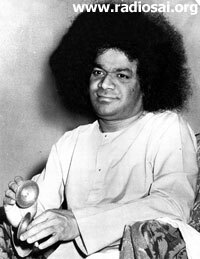 Listening in 1971 to Sri Sathya Sai Baba, a great speaker of Telugu, inspired me to study this mellisonant tongue. Just as Italian has been favoured for librettos and is used for musical terminology by composers, Telugu, of all the South Indian languages, has been chosen by lyricists and musicologists of the South. My spiritual guide, Sir Sathya Sai Baba, a great singer who has a unique far-reaching voice and who is the real Raja of Tyaga, - exemplar of renunciation – helped me find the confidence to reach for new possibilities and the patience to work until reaching completion. When I first encountered him in 1970, I knew nothing of India; he taught my wife and me many bhajans, and showed us the way to silence. 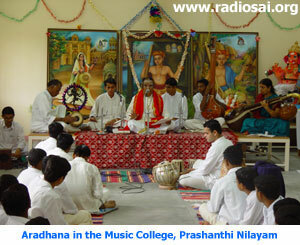 Remarks on Tyagaraja’s musical heritage, the famous Pancharatna Kritis, and the Aradhana festival are made separately. Although the Heart2Heart Team does not claim professional expertise in Carnatic Music, it ventures to make some remarks by way of placing the musical heritage of Tyagaraja in a proper context. The pious and blessed disciple of Thyagaraja. These days, everyone takes the Tyagaraja Aradhana festival for granted. Few realise the key role played by Bangalore Nagarathnammal in all this and her contribution to the continuance of the tradition. Bangalore Nagarathnammal as she is known, was born on November 2, 1878 in Mysore as the daughter of Vakil Subba Rao and Puttulakshmi. She learnt Sanskrit and music from one Giripatta and violin from her uncle Venkitasami Appa of Bangalore. Later she continued her violin training under Munuswamy Appa who had studied under Wallajapet Krishnaswami of the Tyagaraja disciple lineage. 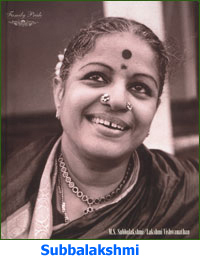 Nagarathnammal also learnt Bharathanatyam [classical dance] but her heart was really in music. Her early life was full of difficulties because her mother was abandoned by her husband. But Nagarathnammal bore this all stoically and in her fifteenth year, she gave a veena concert at the house of the famous Veena Seshanna. From then on, there was no looking back. She had a wonderful and strong voice, and it is reported that between 1905 and 1935, she gave over a thousand concerts. Tyagaraja and the Kannada Saint Purandaradasa [often regarded as the father of Carnatic music] became her heroes, and she did all in her power to preserve their heritage. Tyagaraja became a special favourite because he too had suffered much life, like she had. Once, Tyagaraja appeared in her dream and directed her to go to Tiruvaiyaru to his burial place. This she did and resolved then to build a formal Samadhi [tomb]. With single-minded devotion and dedication, she sold her properties, pooled all her collections, and, enlisting the support of music lovers and devotees of Tyagaraja, she started on October 27, 1921, the construction of the Samadhi on the banks of the Kaveri river in Tiruvaiyaru. The land for the Samadhi was donated by Maneppa Saheb Rajaram Mannaji Surve. The construction was completed and the Samadhi was consecrated on January 7, 1925. This is the venue of the famous Tyagaraja Aradhana festival that takes place every year, marking the death anniversary of the Saint. Nagarathnammal was very pious. She performed Guru Pooja every year and also celebrated Hanuman Jayanthi unfailingly. As the years rolled by, she became increasingly involved with activities at Tiruvaiyaru. She built, from her earnings, the Mysore Choultry at Tiruvaiyaru, where pilgrims going there could lodge free. She established, with much help from the cine actor Nagaiah, the Tyaga Brahma Nilayam, a music school, where she herself gave lessons. In 1949, she executed a will, leaving everything she had for the propagation of Tyagaraja’s musical and spiritual legacy. That same year, she was specially honoured by the Governor General of India. She passed away on May 19, 1952 and is buried in a Samadhi, right next to the one she built for Tyagaraja. To understand better the heritage of Tyagaraja, one must start with the musicians of the period before the advent of the Saint. In that period, the focus was on musical excellence and virtuosity based on what is called ManoDharma, that is to say the unrestrained creativity of the Mind. The music of those days was by and large centred around a scheme called Ragam, Tanam, and Pallavi. More about this shortly but first we must say something about how Tyagaraja made extensive use of a scientific Raga classification scheme called Melakarthas, introduced by a 16th century saint named Venkatamakhi. In brief, the scheme may be described as follows: Seven notes form the basic scale – sa, ri, ga, ma, pa, da, ni; in western music, they are familiar as do, re, mi etc. After ni comes sa again, as an octave of the starting sa. These seven notes are referred to as saptha swaram. The scale is now made richer by introducing additional variations of some of the notes; for example, ri comes in more than one variety. However, sa, and pa do not have companion notes or swaras. Now from this expanded set of swaras where ri, ga etc., have companions or siblings, one can make a variety of complete ascending scales having 7+1 notes and corresponding descending scales. When one ascends, one has only sa, ri, ga, ma, pa, da, ni and sa, although ri etc may be one of the many choices available. A Ragam is a tune with a complete set of scales which remain the same both for going up and down; such a Ragam is referred to as a Melakartha. Venkatamakhi analysed all this and established 72 Melakarthas. This is the starting point. One can create more Ragas by taking a Melakartha Ragam and selectively dropping a few notes while going up and dropping the same notes while going down. One could as well drop some notes while going up and drop others while coming down, and so on. Obviously, there are innumerable possibilities, as any mathematician would point out. However, not all scales so constructed are musically appealing; only some are, and it is left to the genius of the musician to discover the musically appealing Ragams and use them for his or her songs. All this is being mentioned just to highlight how Tyagaraja made brilliant and extensive use of this scheme to compose a very large number of songs, choosing Ragams to convey the mood of the song as contained in the lyrics. Sometimes the song might convey joy; at other times it may be soaked with anguish, and so on. We may at the juncture point out how Tyagaraja brought about a complete revolution in the way music was used and presented to the public. The Ragam, Tanam, Pallavi style adopted by earlier musicians centred almost entirely around displaying virtuoso skills. True, the Pallavi that came at the end proclaimed devotion to God; however, that devotion came somewhat like an add-on. By and large, a musical concert was an occasion for the display of tonal gymnastics. This stress on sheer musical skills turned away many who found that this style was not suited for promoting their sense of devotion or Bhakti. Tyagaraja changed all that but turning the focus entirely on the song, which, invariably was soaked with devotion or Bhakti without sacrificing musical excellence. With Tyagraja, many things converged. First there was Bhakti, which pervaded every word of the song. The song itself had a definite structure. There was the opening called Pallavi that gave the headlines so to speak of the contents of the song, after which came the Anupallavi which was like the sub-headlines. Following these two came the Charanam which gave the details of the message. Tyagaraja took the song and mixed it with good music, that is he set it to one of the wonderful ragas available from the Melkartha scheme. As a scholar put it: Tyagaraja started with a good song in that beautiful language Telugu. He then packed it with Divine feelings and sweetened it further by adding Rama’s name. He topped it all off by setting the song to the most appropriate Ragam available, thereby bringing out the depth of the spiritual message and the musical richness of the composition. In short, he had the winning combination – depth of devotion and the best of music. Kritis which expound the true words of the exalted Upanishads, which are marked by the correct placement of the swaras and rhythmic turns and pauses, which reflect true devotion and vairagya, which are dripping inside and out with juice like grapes and are rich in the nine rasas. Mention must also be made of congregational songs composed by Tyagaraja. Now Tyagaraja had an ancestral house to live in, but since he did not have a job, he had no income as such. In those days, many pious people went around giving musical discourses known as Harikatha. Basically, it was the story of Hari or God, rendered in a musical fashion. During the Shirdi Avatar, devotee Das Ganu was famous for this. He started with Harikatha based on Rama and Krishna but soon switched to narrating the story of Shirdi Baba. Tyagaraja followed instead a slightly different tradition adopted by some pious people. He followed the path of Unchavritti; he would go out and seek alms, singing as he walked the streets. He did not sing Kritis but instead special songs, most amenable for group singing. As he went round the village, people would join him and follow him in the singing. Thus came into existence a special category of songs, that we would compare to Bhajans; however, they have their own musical richness. The beauty about this category of songs was that people without musical training could easily follow him. Tyagaraja did not consider seeking alms as infra dig. On the contrary, he felt it would help him to be humble. He collected only as much food as was needed. Such was the spirit of those times that people gave respect to Tyagaraja and considered it a blessing to give him alms; all that was on account of his extreme piety and his total surrender to Lord Rama. In the years after Tyagaraja gave up his body, his music pervaded all over South India and literally began to dominate Carnatic music. Indeed, towards the end of the nineteenth century and till the middle of the twentieth century, almost all girls in Brahmin families had to learn music and inevitably a good part of it was what Tyagaraja composed. This helped music appreciation to grow in big measure and many took to Carnatic music as a vocation. It was not merely vocalists but also instrumentalists who took to Tyagaraja’s music like a fish takes to water. Indeed, to this day, one can hear the saint’s music played here in Prashanti Nilayam on the Nadaswaram on every festival morning. His music is a synthesis of South Indian culture and is as great as any form of Indian culture. Its Telugu is as simple almost as any Telugu of the girl that goes home in the evening, singing, with her bundle of grass. But from such slim footing Tyagaraja’s music rises as tall as the world. Its tradition is Tamil. The tradition of Alwars and Nayanmars. Its grammar is Carnatic, that is to say, South Indian. Its culture is Indian in vision. Its spirit is human, the spirit of man, the top of creation, communing with his creator. Everyone in South India can understand it, can feel its rhythm, can follow its spirit and feel at home in it. Tyagaraja, more perhaps than any other single musician, has preserved for us our one great live art with an appeal both wide and deep. It is no surprise then that musicians of South India gather every year on Tyagaraja’s death anniversary to honour the saint. This festival called Aradhana is described below. Every year, at the time of the death anniversary of Tyagaraja, there is a week long festival in Tiruvaiyaru during which a musical homage is paid to the saint, mostly by giving short concerts in the immediate proximity of the Samadhi where the Saint is interred. On the anniversary of the day when the Saint merged with his Lord Rama, there is a special routine, during which the musicians of the day, led by the senior ones go round the streets singing, in the same spirit in which Tyagaraja went on Unchavritti. They then assemble in the area set apart for the concerts, and there, after following a set pattern during which certain specific songs of Tyagaraja are sung, they commence singing in chorus the famous Pancharatna Kritis. All this did not start right away, and the practices one now sees have evolved over a period of time. Immediately after Tyagaraja was buried, the disciples of the Tillaistanam school, took upon themselves the daily performance of puja and other rituals at the Samadhi. However, a dispute arose between the two brothers who were direct disciples of Tyagaraja. The elder brother, Panchu Bhagavathar was a very orthodox man and insisted that only Brahmins must be associated with all the activities, particularly the religious ones. His younger brother Narasimha Bhagavathar, on the other hand, was more liberal in outlook and demanded that even as God belongs to all, so do his exalted devotees; there must thus be no discrimination. This disagreement became a big dispute leading, unfortunately, even to litigation. In fact, the practices now followed are what have been stipulated by the Court! How sad!! But that is what human folly is all about. In the beginning, there was no structure at the burial spot; the structure was put up later thanks to the exemplary initiative of Bangalore Nagarthnammal, whose story and the way she was led to our Beloved Swami by Tyagaraja himself, is narrated elsewhere. Till 1908, it was all entirely a religious activity. The practice of holding music concerts in honour of the Saint started that year. Group singing of the Pancharathna Kritis commenced in 1948, and has been going on ever since. As per the order of the Court, Abhishekam is performed to the idol of the Saint three times on Aradhana Day, between 4.00 AM and 6.00 AM by Mr. Chellam Iyer’s group [Mr. Chellam Iyer was a stalwart of the so-called Chinna Katchi or Small Group associated with Narasimha Bhagavathar mentioned above], between 6.00 AM and 8.00 AM by the Bangalore Nagararathnamma Trust and after 8 AM by the Musical Body [Sabha] that organises the main Aradhana festival. The practice of celebrating the Aradhana Day by singing the Pancharathna Kritis has since spread to many places in India and even overseas. We present below six songs, rather arbitrarily selected we must admit, but which nevertheless offer a wonderful glimpse of Tyagaraja, his devotion to Rama and how he used music to give expression his Bhakti. We start with the song Bantu riti kolu in the Ragam Hamsanadam and set to the Adi Talam. In this song, Tyagaraja seeks a position as a guard in Rama’s court, proclaiming his ability to control lust, anger, pride, etc., the evils that tend to destroy a human being. Notice that in the Charanam, Tyagaraja mentions his name. This is a standard musical practice and is referred to as Mudra; basically, the composer signs his name or a pseudoname. Grant me a position for me in Your Court as a guard. Grant me a position for me in Your Court. And Rama Nama shall be my sword. And grant me a position in Your Court as a guard. The next song that we present is Rama Nannu Brovara in the Ragam Harikamboji, set to Rupaka Talam. By the way, Swami often mentions this song in the context of how God loves Bhakti with a good dash of music. 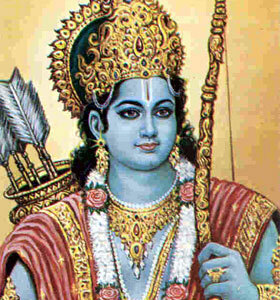 He says that the words Rama Nannu Brovara mean “O Rama, please protect me”. Yes, the Lord will protect us for sure but He would like it better if the words were offered musically! That is because according to Swami God is Ganapriyudu, that is, a Lover of Music. It is worth mentioning that Harikamboji is a difficult Ragam to render since the slightest mistake can take one on the slippery slope of wrong notes to neighbouring Ragams. Do not come forward to protect me? By spending money to the point of being in debt. And yet, how is it that You do not come forward to protect me? This song, by the way, reflects a mood that we all slip into at times. Do we not say, “Swami, don’t you see how good I am? And yet, I do not receive Your attention!” It is comforting that even a great Bhakta like Tyagaraja was given to such moods that often afflict us mere mortals! The third song in our series starts with the poignant words Teliyaleru Rama in the Ragam Dhenuka. This song set in Adi Talam highlights how misguided people focus on external symbols in their quest for Bhakti but do so only in vain. This is typical of many songs of Tyagaraja that define the true meaning of Bhakti, and when studied along with Swami’s teachings, reveal how Tyagaraja intuitively grasped the very essence of true devotion. The true path of Ramabhakti! But they cannot know the path of Ramabhakti! But their real concern is to use display to earn money. They cannot ever know the path of Ramabhakti! The next song in our list is Sobillu Saptaswara in the Ragam Jaganmohini and set to Rupaka Talam. Most saints do not write songs about music itself, but for Tyagaraja music was the meeting place of the human and the Divine. Thus, he has not only composed many songs about music but also how music should be learnt and pursued. In the song presented below, Tyagaraja describes the seven basic notes and explains where they reside, externally as well as internally. beautiful goddesses of the seven musical notes. Do those splendorous notes shine. And in the minds of the deities and holy men! We move on now to the majestic song O Ranga Sayee, composed by Tyagaraja while worshipping Lord Naryana as He gives Darshan in the famous temple in Sri Rangam on the Kaveri, not far from Tiruvaiyaru. 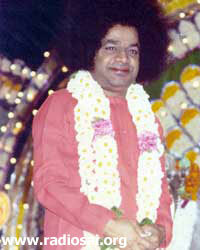 Late M.S.Subbalakshmi presented this song before Swami during the celebrations of the 70th Birthday. Seeing Swami before her, she could not but change Ranga Sayee to Sathya Sai, sweeping the huge gathering of devotees to great heights of ecstasy. This song is in the glorious Ragam Kamboji and is set to Adi Talam. Like many of Tyagaraja’s songs it is a cry to the Lord to come and give Darshan. Tyagaraja packs every one of these songs with such passion that one is reminded of Ramakrishna Paramahamsa who often wailed, “One more day gone and I have not had the Darshan of the Divine Mother!” That is what true Bhakti is all about – the soul cries out for the Lord with the same anguish as that of a tender calf that has lost its mother. 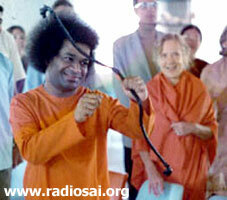 Has not Siva become the Lord of Kailasa at Your instance? When will my grief come to an end? Living amidst jealous people who cannot bear to see others prosper. By having Darshan of Your form with pearls dangling on Your chest! O Rangasayee the jewel in Tyagaraja’s heart! Pay heed to my call and come. The last song in our limited selection is Dasarathe in the incomparably majestic Ragam Todi, and is set to Adi Talam. Todi is a connoisseur’s delight capable of infinite subtle variations of exquisite beauty that transport the listener to the very heavens. The way Tyagaraja exploits the profound depth of this Ragam must move every person including one not familiar with Carnatic music; for such is power of that Ragam and the lyric of Tyagaraja. To You with a sacred Name! O Jewel amongst music connoisseurs! You have made my music known in distant lands to my heart’s content. O son of Dasaratha! How ever could I repay You! That confer good here and Liberation in the other world. It is interesting that Tyagaraja speaks of being guided in his dreams. The same has happened to innumerable devotees of Swami – no surprise in that since Rama is Swami and Swami is Rama. Rathna means gem and every song of Tyagaraja is a gem in its own right. Yet, five out of the hundreds that Tyagaraja composed have been hailed as THE FIVE GEMS. Popularly referred to as Pancharathna Kritis, they are set to five major Ragams called Ghana Ragams. There appears to be history behind these five songs of incredible depth and spectacular musical beauty. Those were days when music was associated primarily with display of virtuoso skills before discriminating audiences, especially those in royal courts. Yes the small Pallavi that followed the gymnastics invoked the Name of God, but mostly it was musical pyrotechnics. Tyagaraja who was not interested in patronage focussed on Bhakti, and this led many to scoff at him as one who was musically incompetent which was why he composed “mediocre” songs. In part this criticism was based on the fact that Tyagaraja’s Telugu was not in a high literary style; instead, it was supposed to be colloquial. What these critics missed was Tyagaraja was always in conversation with Rama, and one does not make conversation in high-flown language. If Heart to Heart dialogue is couched in literary language, it would become highly theatrical, a point that ignorant critics totally missed. To cut a long story short, Tyagaraja decided to silence his critics with something overwhelming and thus came into existence the Pancharathnas set in weighty Ragams called Gana Ragams. They will forever proclaim not only Tyagaraja’s matchless devotion to God but also his musical brilliance. For your pleasure, we offer the audio of the last song of this immortal five, as sung by students and staff of Swami’s Music College . "Tyagaraja, in his song Evarani nirnayanchedira, has explained the significance of the two letters in the word Rama. He says, “In the Naranyana Mantra ‘Om Namo Narayanaya’, ‘Ra’ is the fundamental letter (Jiva Akshara), and in the Siva Mantra ‘Om Namah Sivaya’, ‘Ma’ plays a similar role. Without these letters, the two Mantras would be lifeless and meaningless. ‘Ra’ and ‘Ma’ combine to form Rama. One who knows this Truth, is worthy of respect and I prostrate before him”. There is hardly anyone who does not utter the name of God in one form or the other. At least they name their children after God, so that consciously or otherwise, they utter the name of the Lord while calling their children." Well, if we compile what Swami has said on Tyagaraja, it would be in volumes, too less to cover in a feature article. In the coming issues, we will try to give more glimpses into the life and works of this great spiritual saint of India and an exemplary devotee of the Lord! We plan to take selected immortal compositions of Tyagaraja and offer a special treat to all our Radiosai listeners on Tyagaraja Aradhana Day. Do not miss this special treat on Jan 19th, 2006!